In the week since a shocking defeat, Democrats and other Trump critics have engaged in what will undoubtedly be a long process of explanation-seeking and recrimination. In a very close election, a great many factors can be plausibly put forward as “the” reason for Trump’s victory and Clinton’s defeat. Confirmation bias makes it easy to engage in the psychologically appealing practice of assigning blame to people and institutions we already oppose, or credit to those we agree with. Here, we attempt to bring some semblance of order to the variety of explanations that so many Trump opponents have spent the last week proposing. Call it a post-mortem of the post-mortems. This morning, we publish part one—the structural and institutional factors that shaped this year’s election results: the “fundamentals,” the electoral rules, the party institutions, and the media. This afternoon, stay tuned for an analysis of the voters and their motivations. Presidential election results can be predicted with a very high level of accuracy using only three factors: the state of the economy, the favorability of the sitting president, and the length of time the incumbent party has held the White House. By this very basic model, 2016 was likely to be a good year for Republicans. In August, political scientist Alan Abramowitz predicted that there would be a 66% chance of a Republican victory. Some have therefore argued that Trump’s victory is not extraordinary. This is an oversimplification. Donald Trump was not, by any standard, a generic Republican, a point we discuss at much greater length below. Moreover, Hillary Clinton won the popular vote, but lost the electoral college. Which brings us to…. If you want the most proximate cause for Clinton’s defeat, the electoral college is a solid contender. It is also not an issue that is likely to go away. The electoral college puts a thumb on the scale for states with smaller populations, and the winner-take-all allocation of electoral votes means that voters in states with close contests get an out-sized power. Given the current party configurations, that meant bad news for the Democrats. Of course, without an electoral college, American elections would look very different. Every vote in every state would be equally valuable. We cannot automatically assume that the election would have played out as it did, given what a fundamental re-writing of the campaign rules—and concomitantly, candidate strategies—a popular-vote based election would be. Moreover, the electoral college is not the only way that American electoral rules may have changed the outcome this year. As one of us has written before, the contemporary movement for voter suppression is not new, but it is resurgent. Particularly in states where their electoral coalition is in decline, Republicans have promoted laws that intentionally and systematically disenfranchise young people, minorities, and the poor—three solid Democratic constituencies. This is also the first presidential election since the repeal of major portions of the Voting Rights Act. At least 868 polling places were closed in VRA jurisdictions, meaning many voters in traditionally Democratic locales had to travel further, wait longer, and sort through confusion in order to cast their ballots. Political scientists are undoubtedly already at work to assess the effect of voter suppression efforts on this election. The first test will certainly be in Wisconsin where 300,000 registered voters lacked the needed forms of voter ID, and where Trump won by a margin of only one percent, or less than 30,000 votes. Though Trump’s victory in North Carolina was substantially larger, there is evidence that voter suppression played a meaningful role in reducing Democratic support there. Despite some commentary to the contrary, one aspect of the U.S. electoral system that does not appear to have been decisive this year is the role of third parties as potential “spoilers” in a first-past-the-post race. One analysis found that Clinton would have had to win all of Jill Stein’s Green Party votes plus 60% of the votes received by Libertarian Gary Johnson in Michigan, Pennsylvania, and Wisconsin to flip the election the other way. That these voters would have voted Clinton in a two-way race, rather than stay home or vote Trump, is not at all obvious. So far, every factor we’ve examined helps explain why a Republican won this year. But that’s not enough to explain why the new president will be Donald Trump, or why he was running against Hillary Clinton. Trump’s place at the top of the Republican ticket was an outcome that few Republican elites predicted, and many (ineffectually) complained about. The inability of the Republican establishment to control the nomination process was out of keeping with the modern history of the party. The decline of the institutional power of the GOP likely stems in part from the rollback of campaign finance restrictions, which has helped move political money into unaccountable “shadow parties” that can operate with funding from one or a handful of big-money donors. This lets candidates stay in the race longer, as long as they can continue fund themselves. The weakening of party institutions has also been shown to have promoted a growing desire for “outsider” candidates in the Rust Belt. But the Democratic Party also seems fragile, particularly when it comes to building and maintaining institutions and infrastructure outside of the major urban areas on the Coasts. Since the New Deal, unions have been a key component of the Democratic coalition and a frontline force for Democratic election turnout. As a result of recent legislation to limit collective bargaining and other union organizing tools, union membership is down sharply in Michigan and Wisconsin. There is also some speculative evidence to suggest union households may have drifted away from Clinton—though these results rest mostly on questionable exit polling. As in the case of voter suppression laws, additional rigorous research could test the plausible assertion that union decline in the Rust Belt was substantial enough to cost Clinton the presidency. A second critique leveled at the Democratic Party is the choice of Hillary Clinton to lead the Democratic ticket. As Ezra Klein noted, the presidential primary featured a “very strange, narrow field.” One reason for the relative dearth of Democratic candidates is that the Clinton campaign made a concerted effort to ease her path to the nomination. Critiques of the choice to put Clinton at the top of the ticket typically revolve around her centrism and her ties to unpopular aspects of the status quo: Wall Street, to 90s-era policies like welfare reform and mass incarceration, and the Iraq War. Finally, some have questioned the quality of the Clinton campaign operation. By any standard, Clinton ran a much more sophisticated campaign than Trump. Clinton raised more money than Trump, spent more on ads, and had a larger number of field offices. Some political scientists had predicted this difference in campaign professionalism would be devastating for Trump. This clearly was not the case. Some have argued that the Clinton campaign simply enacted their tactics poorly, or that Republican institutions outside of the official Trump campaign may have played a critical role. But others will take this failure as further evidence that campaigns matter far less than the public tends to imagine. The final common institutional explanation for the Trump victory in 2016 is the behavior of the media. Leaders of the Clinton campaign have suggested that the media is to blame for their candidate’s loss, and many others have criticized how journalists covered the 2016 campaign. These arguments typically cite one of three factors: the high amount of press Trump received, a pattern of “false equivalence” between the candidates, and the media environment. As CBS executive Les Moonves admitted, the Trump candidacy “may not be good for America, but it’s damn good for CBS.” The media gave an unprecedented amount of free coverage to Donald Trump. A study by the Harvard Kennedy School’s Shorenstein Center found that Trump’s coverage ran far ahead of what would be typical given his performance in the polls. Moreover, most of this early coverage was positive. By March, the New York Times estimated that Trump had already received close to $2 billion worth of free media exposure, coverage which often displaced messaging by Trump’s primary opponents. A detailed analysis by fivethirtyeight provides a calendar of how day-by-day, Trump coverage often led over that of rival GOP candidates and other news events. During the primary, about 75 percent of voters thought that Trump had received too much coverage. What did all this coverage mean for Trump’s campaign? Media coverage plays a critical role in presidential primaries. The attention Trump received very early on the pre-primary season, while his polling was still very low, is likely to have been a significant factor in his rise. The evidence is somewhat less clear, however, when it comes to media’s impact on general elections, where voters have strong partisan attachments. Many prominent political scientists have been publicly skeptical that Clinton’s woes can be explained by media coverage. For instance, Clinton received the overwhelming majority of mainstream newspaper endorsements—and surprise endorsements have been shown to increase support for the endorsee. 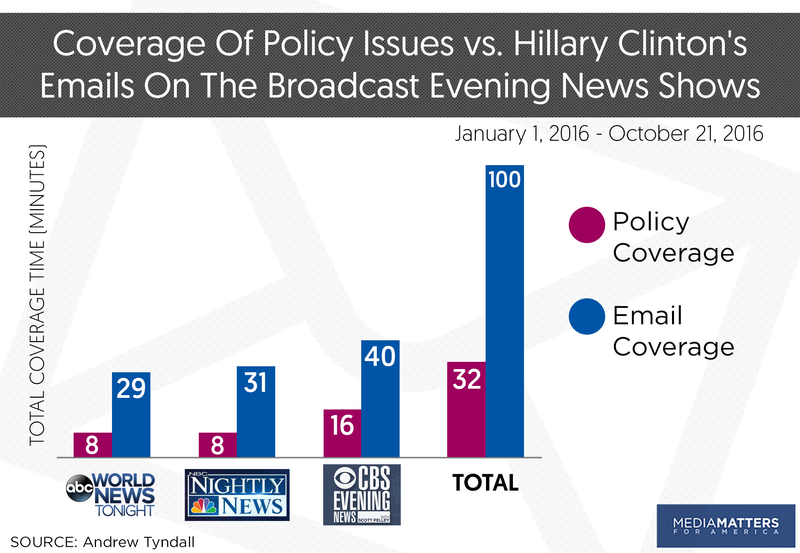 It is true, however, that Clinton’s email server dominated the news; for every one story concerning policy, three dealt with Clinton’s emails. Critics have charged that the email coverage made up part of a pattern in which Clinton scandals were over-inflated while Trump’s were deflated in order to give the impression of balanced reporting. Media effect tends to be short-lived, but the unexpected decision of F.B.I. director James Comey to speak publicly about Clinton’s email controversy in late October could conceivably have been late enough to have some kind of impact on the result, as Hillary Clinton herself has claimed. But there is not yet clear evidence of this; Comey’s announcement was associated with a decline in Clinton’s lead in the national polls, but that lead had already been shrinking prior to the announcement. The final aspect of the media environment that some have suggested played into Trump’s hands is the rise of partisan cable news and social media. These media platforms allow users to curate their news feeds, filtering out information they might disagree with. One consequence was the proliferation of fake news stories and conspiracy theories, which Trump supporters were, on average, more likely to believe. New media may have also helped usher ideas into mainstream coverage that were once isolated on the extremes of the political spectrum. In at least one study, access to conservative media was shown to increase Republican vote share. Many structural and institutional factors played a role in the defeat of Hillary Clinton and the victory of Donald Trump in the 2016 presidential election. The “fundamentals”—the state of the economy, and the fact Clinton would have been the Democrats’ third consecutive term in the White house—were bad for the Democrats. The electoral rules also benefitted Republicans, most obviously via the electoral college, but also through new laws to suppress the vote of traditionally Democratic constituencies. Republicans also likely benefited from the success of their campaigns to undermine the organizing power of unions in the Rust Belt. Both the Democratic and the Republican party infrastructures have weakened in critical ways that shaped the nomination processes, leading to an election between two exceptionally unpopular candidates. Less clear are the effects of the media and the campaign itself. Trump’s rise in the Republican primary was certainly assisted by very high levels of media attention, and possibly a media environment that allowed for previously fringe beliefs to enter the political mainstream. Clinton’s campaign sophistication was clearly not enough to achieve victory; we do not yet know whether that is the result of tactical errors, or simply additional evidence that campaign effects are often smaller than is publicly believed. Of course, all of these structural factors had an impact via the voters themselves. This afternoon, we will examine who voted for Clinton, who voted for Trump, and what we know about why.